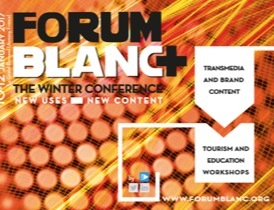 Tarantula and Elise André are at the 2017 edition of Forum Blanc, the winter conference where we can talk about transmedia creation, brand content and multimedia storytelling. The traditional conference presentations will be supplemented by the Forum Blanc workshops, hosted by industry professionals and devoted to two transmedia oriented fields: tourism and education. The event is still maintaining its main transmedia creation guideline and is branching out this year into brand content and multimedia storytelling. In addition to developments in traditional media the event will also be concentrating on natively digital media (including video games).